Communication can be incredibly limited in patients with advanced amyotrophic lateral sclerosis (ALS), a degenerative motor neuron disease also known as Lou Gehrig’s disease. Those who can communicate minimally with eye movements are considered “locked in,” and those who can no longer communicate with eye blinks or eye rolls are referred to as having complete locked-in syndrome, or CLIS. Most of these patients are believed to remain cognitively aware but cannot communicate any thoughts or feelings to caregivers. For CLIS patients, “quality of life depends on social care by the family and positive social attention from caretakers and friends,” Niels Birbaumer, senior research fellow in neuroscience and psychology at the Wyss Center in Geneva, Switzerland, tells mental_floss. Researchers have continued to look for ways to offer these patients noninvasive methods of communicating with their caregivers and loved ones. Birbaumer and his colleagues’ new clinical trial offers some fresh hope to CLIS ALS patients with a new brain-computer technology that can essentially “read” the thoughts of these patients and translate their answers to caregivers through a computer interface. Their results were published today in the journal PLOS Biology [PDF]. The system takes the form of a noninvasive cap, worn on the head. 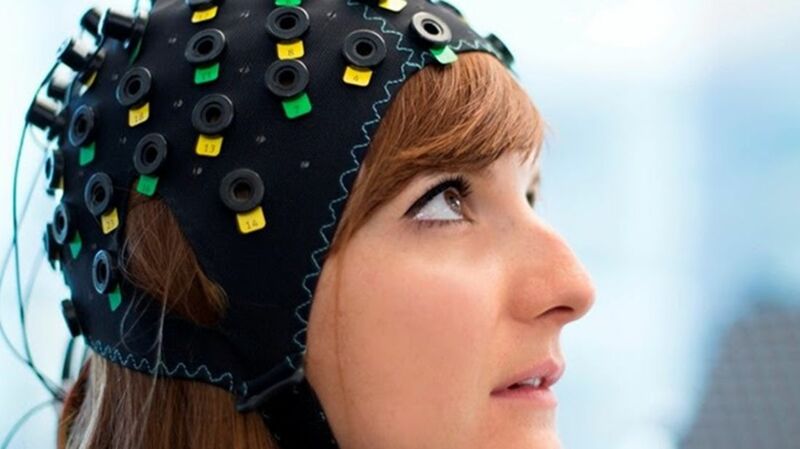 Functional near-infrared spectroscopy (fNIRS) determines changes in blood flow in the brain, and an electroencephalogram (EEG) hookup monitors sleep and electrical activity in the brain. It is not the first brain-computer interface that exists to help paralyzed patients communicate, but near-infrared spectroscopy is the only approach that has successfully enabled communication for CLIS patients. The trial focused specifically on four patients with advanced ALS—two of them in permanent CLIS, and two who were close to entering CLIS, with unreliable communication. Three patients completed more than 46 sessions spread over several weeks, and one patient completed 20 sessions. The participants trained over the course of several weeks by responding to 500 questions, such as "The capital of Germany is Paris." They also answered personal questions with known answers ("Your husband's name is Joachim") and unknown answers ("You want to be moved from left to right"). The questions elicited correct responses 70 percent of the time. Birbaumer and his team would also like to take the knowledge they’ve gained with ALS CLIS patients and extend it to those who experience chronic strokes. Whatever their next steps, this technology may allow people living in the silence of their own minds a chance to engage in life-improving social interaction.